Just like that, summer has come and gone! Due to having three events on the same day, I found myself unable to attend our August pot luck. I have heard back from several members that the event went off very well and everyone had a great time. My thanks to John and Ann for hosting, showing off their wonderful collection, and sharing their home to all. AND— congratulations on their anniversary! We will be kicking off our second half of the year with a presentation by Daniel Martinez on his visit to Ryan Neil’s fabulous compound. 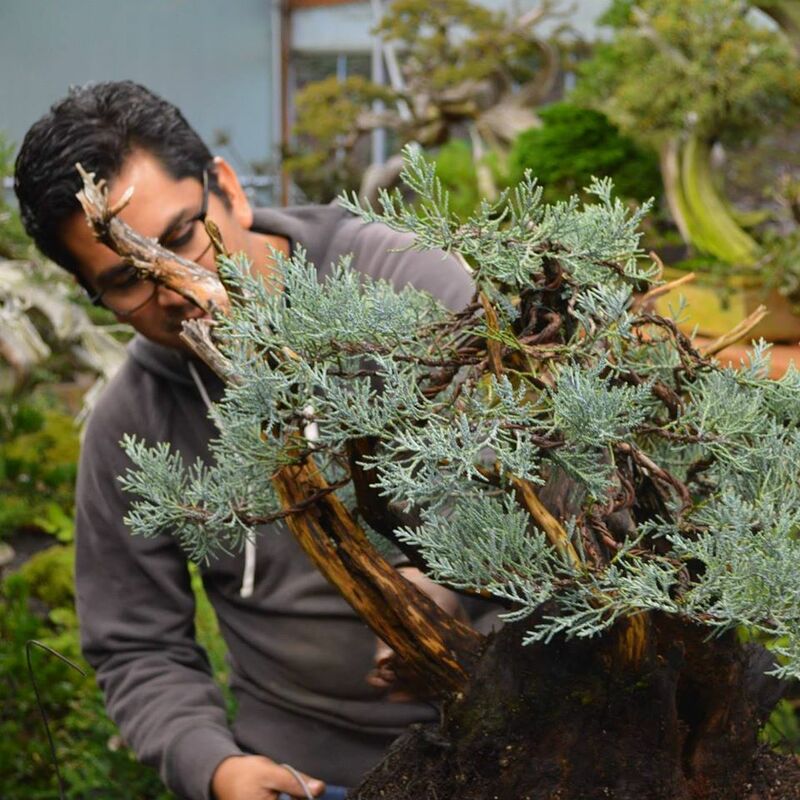 This will be a great chance to hear Daniel’s insights on one of the United States’ newest masters of bonsai. Hope to see you at the Tuesday, September 9, meeting. I can confirm what Tom said in his President’s Message: The potluck was a great success and everyone had a good time. John and Ann are good hosts and their bonsai and bonsai display area are models for the rest of us to emulate. The food was abundant and good, and the raffle was a lot of fun. The raffle brought in $137 for the club treasury. There were some interesting items in the raffle, including one of Mel Ikeda’s famous raft junipers from a recent demo he did for our club. It was won by our youngest member, Tyler DeBlauw. That’s Tyler standing by his new acquisition with his mom on the left in the picture on the next page. Tyler is very enthusiastic and knowledgeable about bonsai and I’m sure the tree will do well in his care. The other picture is an overview of Ann and John’s display area. Most of the partygoers are relaxing in the shade finishing dessert. 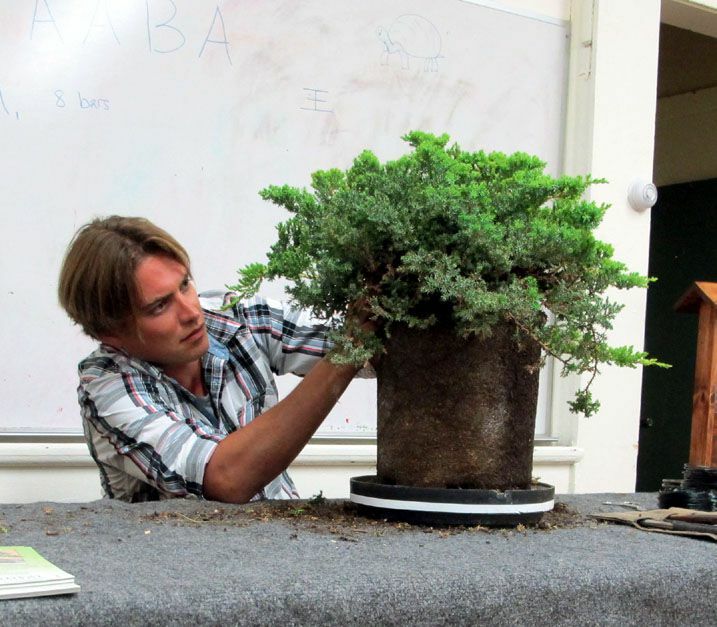 September 20: Bonsai Club Of Santa Barbara: Saturday Workshop With Guest Instructor. 9:00 AM until noon or 1:00 to 4:00 PM., Room 7, Goleta Valley Community Center. Mel Ikeda, guest instructor. 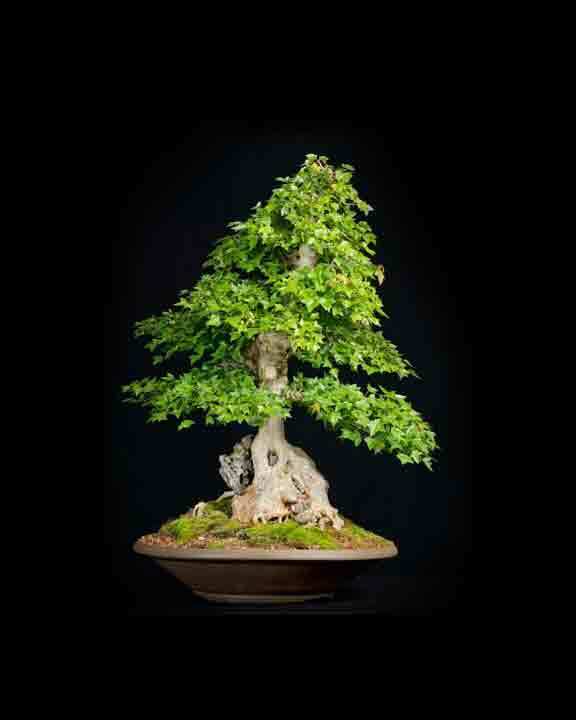 October 4 – 5, 2014, Thousand Oaks, California Conejo Valley Bonsai Society. 11th Annual Bonsai Exhibition. Gardens of the World’s Resource Center, 2001 Thousand Oaks Blvd. Hours are 9 AM–4 PM with demonstrations at 11 AM and 2 PM (both days). Free Admission. Note: No sales of bonsai related items. 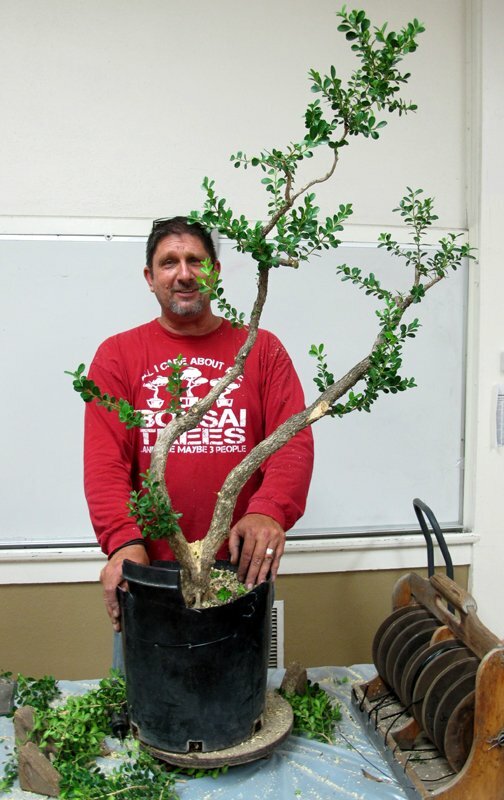 For information, call Marj Branson at 805-373-1330 or visit their website: www.cvbs-bonsai.org. 11AM-4PM, El Presidio de Santa Bárbara State Historic Park, 123 East Canon Perdido Street, Santa Barbara. Our club has been invited to participate once again and we will have a small display of bonsai. Let Joe Olson know if you would like to participate. Jim has agreed to put on another of his popular make-your-own-pot workshops. Cost: just $20.00, open to all members.